There are tons of drone models out there in all price ranges. To narrow things down a bit, I decided to put together a list of the top 10 drones for under $500 on Amazon — one of the biggest online drone sellers. You will find some of the best drones for getting started in the drone industry and practicing your pilots skills, including an excellent quadcopter for aerial photography and videography (the DJI Phantom 3 Standard). As drone technology continues to get more advanced, the industry pumps out new models to meet demand. This drops prices lower and lower, so you can get a lot more for your money these days. Scroll down to start from the beginning, or use the table below to get an overview of each top drone for sale. Click here to check out the full list of top drones for under $500. The DJI Phantom 3 Standard is the best drone with a camera in this list. It has a 25-minute flight time, can shoot 2.7K video, it takes 12 megapixel still photos, and it comes with DJI’s intelligent GPS-enabled flight modes. This puts the Phantom 3 Standard ahead of many other drones in its price range. 1. The Phantom 3 Advanced —The Phantom 3 Advanced also shoots 2.7k video and takes 12 megapixel stills, but control distance increases to 5 km and it offers live FPV (first person view) streaming of the camera’s view to your controller. 2. The Phantom 3 Professional —The Phantom 3 Professional’s video quality takes a massive jump up to 4K, making it an excellent choice for pro pilots. 3. The Phantom 3 4K —The Phantom 3 4K offers 4K video capture capability, just like the Professional, but flight range decreases to 1,200m. The Phantom 3 Standard has an almost unbeatable price-to-features ratio, making it an excellent lower-priced quadcopter for professional or recreational aerial filming. 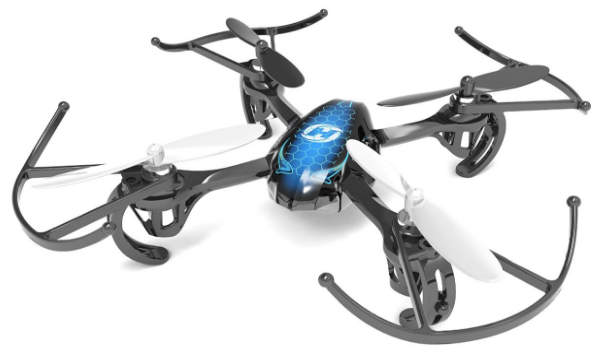 The JJRC H8D is a ready-to-fly first person view (FPV) quadcopter. The drone itself comes with a 2MP camera and a 5.8GHz wireless transmission system. It also comes with four propeller guards to protect it during crashes. In the package, you get an LCD screen (to get a live stream of your camera’s view in real time), extra propellers, extra batteries, and a carrying case. For under $200, the JJRC H8D (and its package) makes it a top drone for experiencing aerial videography and photography. The UDI 818A HD+ is a cheap RC drone that comes with a camera. This quadcopter’s HD camera takes aerial photos, videos, and stores it all on an upgraded 4GB MicroSD card. The drone comes with two extra batteries for longer flight sessions, and the controller has an LCD screen to view important flight telemetry data, like battery percentage to help you know when it’s time to land. The UDI 818A HD+ is also manufactured with some of the sturdiest propeller guards available. The Holy Stone F181 is a great remote control quadcopter for improving your aerial videography and photography. It comes with an onboard camera that shoots video in HD 720p, and the UAV offers one-key “return-to-home” (a press of a button brings the drone back to you). The controller also comes with an LCD screen that shows you flight telemetry data. For under $100, the Holy Stone F181 is a top training drone. The DBPOWER MJX X400W is a #1 best selling quadcopter on Amazon, with 4.5 stars and over 200 reviews. It’s one of the only small drones with first person view capability. You can connect the drone’s camera to your phone via WiFi and see what your drone sees in real time, via the MJX FPV app. Or you can use your own virtual reality headset. The MJX X400W also has a control distance of 100 meters, giving you more than enough range to get an aerial view of the world around you. The Cheerwing Syma X5SW is a play off the popular Syma X5C quadcopter (also featured in this list). This upgraded version offers an HD camera with picture and video capability as well, but it also allows FPV access through a WiFi connection between the drone and your smartphone (both iOS and Android). The Cheerwing Syma X5SW can do 360 flips in any direction, and its controller can switch to left-handed control mode, so it’s ideal for all pilots. With 4.5 stars and over 1,500 customer reviews, the Holy Stone HS170 Predator is one of the top rated mini drones on Amazon. The headless security system lowers the learning curve so that any level of drone pilot can fly it. It’s also powerful enough to be wind resistant outdoors, yet small enough for safe flight indoors. And it has a high top speed for the speed demons out there. The HS170 Predator‘s three flight modes also mean that as your skills increase, you can continue training with this quadcopter for an extended period of time before upgrading to a new one. The Akaso X5C is a lightweight and durable quad. It comes with an HD camera and propeller guards standard to protect it during flight. The hull and guards are also removable, making it suitable for indoor and outdoor flying. And if you’re looking to ramp things up a notch, the Akaso X5C offers high performance mode which increases the drone’s speed substantially. (It’s also the #1 best seller in Hobby RC Quadcopters & Multirotors on Amazon). It’s cheap (priced around the same as most miniature drones), so if you crash you aren’t risking a large investment. And it offers image capture capability with its 2MP camera. You won’t get pristine quality shots, but you will be able to learn the ropes, fly indoors and outdoors, and practice the skills necessary to fly a more expensive rig. The Hubsan X4 is widely regarded as one of the top drones for beginner pilots. It’s small enough to fly indoors, but powerful enough to handle moderate wind outdoors. It’s also cheap (under $50), as far as most drone models go. The X4 is for sale in many versions, but the H107C comes with a camera as its defining feature. It can do 360-degree flips, and the 6-axis stabilization system helps new pilots get in the air quickly, safely, and efficiently. This micro drone is a great option for new pilots, and a fun one for more experienced enthusiasts as well. This list of the top drones on Amazon for under $500 is a great starting point for many aspiring UAV pilots. Make sure to weigh all of your options carefully, and choose a drone based on the features you want, your budget, and your skill level.